Made up of the finest grade material and cutting-edge technology, our products have seamless quality. 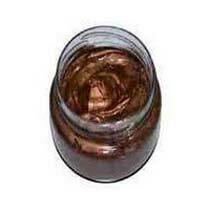 We are the most promising name, involved in supplying Copper Grease. Composition : ISOL AS 550 Anti - Seize Grease is a special grade containing finely divided copper metal for improved high temperature resistance and anti seizure properties for special applications. It is made up of a combination of solid lubricants and semi synthetic base fluid. Features : ISOL AS 550 aid assembly and non - destructive dismantling of threaded/ screwed assemblies such as nuts, bolts, pipe joints etc. even after long periods of service under extreme conditions of heat, moisture, corrosion and environmental attack. Friction in screwed thread is the main factor governing the tightening force. Insufficient tightening leads either to deterioration of functional properties of the joint or to loosening under the action of vibration or variable loads. Excessive tightening results in breakage or jamming in the thread. Ordinary oils and greases are unsuitable for such applications as they decompose at high temperature and under excessive moisture and environmental attack. ISOL AS 550 is the right choice for such applications. They provide service from -30oC to + 550oC in vacuum and from -30oC to + 550oC in the presence of air. In addition they provide excellent ageing and fretting corrosion resistance. General purpose anti seize applications like threaded connectors and assemblies of turbines, internal combustion engines, threaded assemblies used in the oil refinery, power, cement, gas and chemical processing, steel plants. General plant maintenance of threaded connections of machine assembly in boilers, heat exchangers, plastic extrusion nozzles, conveyor assemblies operating in furnaces, furnace and kiln assemblies, incinerators, hot air exhaust manifolds, dies, moulds, hinges, manifold bolts, spark plug threads and wheel bolt etc.